imprisoned in the stone and reveal it. His passion for the beauty of marble, and for his spiritual life were the greatest influences on his works. Michelangelo’s passion for sculpture sent him year after year to the town of Cararra, Italy where stone quarries are known for their pure white blocks of marble. Selecting the perfect marble blocks for each subject was of great importance to the artist. One of his most famous sculptures, the Pieta was carved in Rome between 1497 and 1500 before Michelangelo was 25 years old. The famous work portrays the body of Jesus laying across the lap of his mother, Mary, after the Crucifixion. This is the only piece of work that Michelangelo ever signed. It is said that upon completion and delivery to the Chapel of Santa Petronilla he overheard someone say that he was too young to be the sculptor. Later that evening Michelangelo returned and, in anger, carved his name into the sash running across Mary’s chest. Michelangelo’s most famous sculptural work, David, was completed in 1504. If he had not yet secured his fame as an artist, this piece completed the task of establishing Michelangelo as one of Florence’s greatest sculptors. The classic style and perfectly proportioned body portray the Biblical King David as a young man about to engage in battle with the giant Goliath. The statue was to commemorate the liberty of Florence. 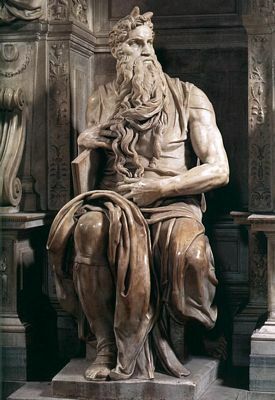 Michelangelo’s last major sculpture was Moses, carved for the tomb of Pope Julius II. The tomb’s dimensions were originally considerably larger and would include some 40 oversized figures. Due to complications the tomb size decreased and became a simple wall tomb. The central figure on the tomb is that of Moses. The patriarch with long beard and horns on his head sits holding the Ten Commandments. Michelangelo’s sculptures are still popular today. Those who want to own a sculpture inspired by one of Michelangelo’s famous works can find them at places like Staute.com.